Batman and video games go together like cake and my mouth. Who doesn’t want to play as the caped crusader, grappling-hookin’ it around, driving the Batmobile and punching baddies in the face to keep the streets of Gotham City clean? 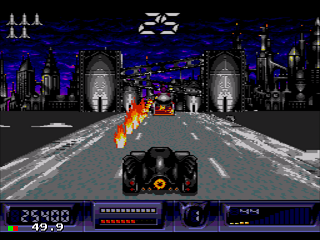 SEGA had previously monopolised on this winning formula with a game adaptation of the 1989 Batman film so a game based on the 1992 follow-up Batman Returns was inevitable. However, despite the game and the film sharing the same name, the SEGA game is actually a continuation of the plot from Batman Returns. After The Penguin kills the Ice Princess, the blame is pushed onto Batman who must now seek revenge and clear his name. 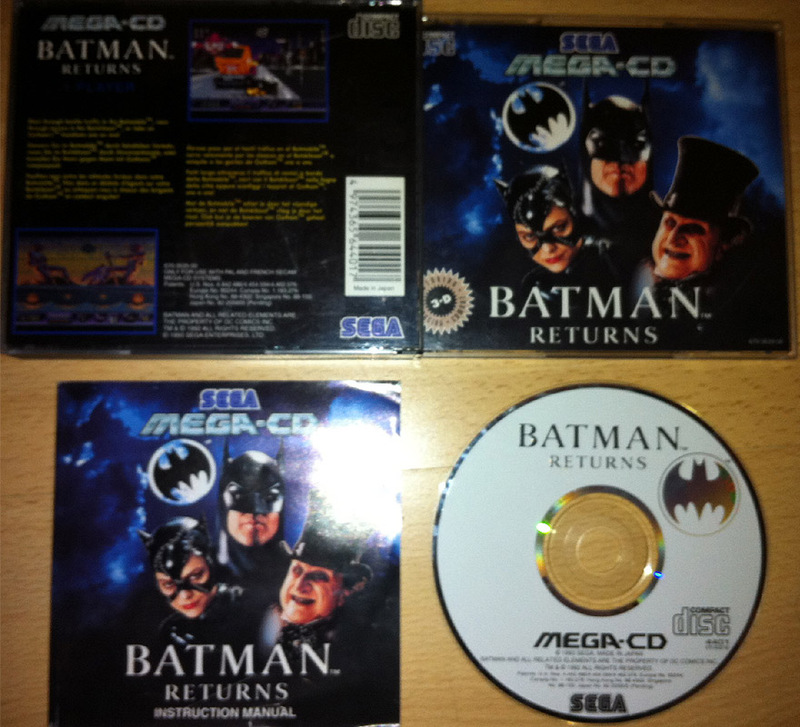 The Mega CD version of Batman Returns is actually an expanded port of the Mega Drive version. On top of the original game, Malibu Interactive have seen fit to add some new Batmobile sections. Little do you know, these sections are actually the real reason you’ll want to play Batman Returns. This is due to the rather poor execution of the original game and it’s dodgy take on action platforming. As Batman, you have the ability to punch, kick and jump as well as use your grappling hook to reach higher places and swing on scenery. Power-ups like Batarangs and grenades are also available to add a little extra oomph to Batman’s arsenal. All sounds like rather good fun doesn’t it? Well you’d be wrong my friend. The big problem with the platforming stages in Batman Returns is the unreliable hit detection and the constant need to make complete leaps of faith which is entirely down to poor camera placement and level design. You will find yourself getting destroyed by enemies while you can hardly get a returning hit back in and inevitably falling to your doom as you cannot see what is beneath you. Beating these stages comes down to dumb luck and makes for an infuriating session of gaming. They’re also rather ugly to look at. 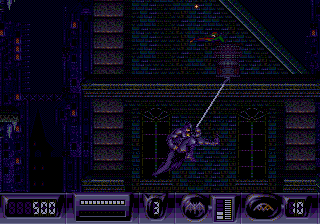 Because the stages are so dark, the Mega CD and its’ rather limited colour palette have a lot of trouble rendering different shades of blue and purple to keep things looking suitably grim. This also results in a remarkable overuse of the revolting stippling effect that you generally see more often on pre-rendered images that are converted to display using the Mega CD’s colour palette. On the other side we do have the Batmobile stages to look forward to and Malibu Interactive have seen sense to give you the option to play these stages on their own, intertwined with the original game or (God forbid) not at all in favour of the platforming stages. 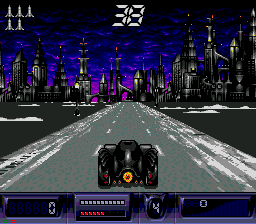 Trust me, the Batmobile stages are the real reason you want to give the Mega CD version of Batman Returns a spin. These stages feature beautifully rendered scenery and amazing use scaling with hardly any slowdown in the more hectic sections. The Batmobile has the ability to fire machine-guns and rockets (which are limited) and as long as it isn’t bombarded with Molotov cocktails and flamethrowers, you can also shunt other vehicles around without any damage to your own. The action is really intense and an absolute joy to plough through. Anyone without a penchant for masochistic gameplay should seriously think about playing the Batmobile stages over the cruddy platforming stages. Regardless, the entire game has a fantastic soundtrack composed by Spencer Nielsen. It’s mostly rock-based and suits the frantic action perfectly. This rounds off a very well presented package (well, despite the platforming sections but I shouldn’t have to make that more obvious now) and should be a serious consideration for any Mega CD owner.